Home. Where the heart is. For Bombino and most other Tuareg, there’s only one place that can be. In recent years, the rest of the world has largely written off that home as a hot and savage wasteland, a bolt hole for religious extremists and terrorists, a geopolitical video nasty with little to offer apart from the oil, gold and phosphates that lie beneath its soil. But Bombino would like us to take a closer look and think again. His feelings are beautifully summed up in the song “Tehigren” (‘Trees’), from his brand new album Deran: ‘Do not forget the green trees / In our valleys in the Sahara / In the shade of which, / Rest the beautiful girls / Radiant and lovable’. How to celebrate that desert home, how to protect it, develop it, unify it, respect it and, above all, never forget it, are the salient themes of Deran. They’re dressed up in ten songs of rare maturity and power that mark a turning point in the career of a guitarist and songwriter who was born in the shade of an acacia tree about eighty miles north west of the ancient town of Agadez, and has since risen to forefront of the new Tuareg guitar generation. 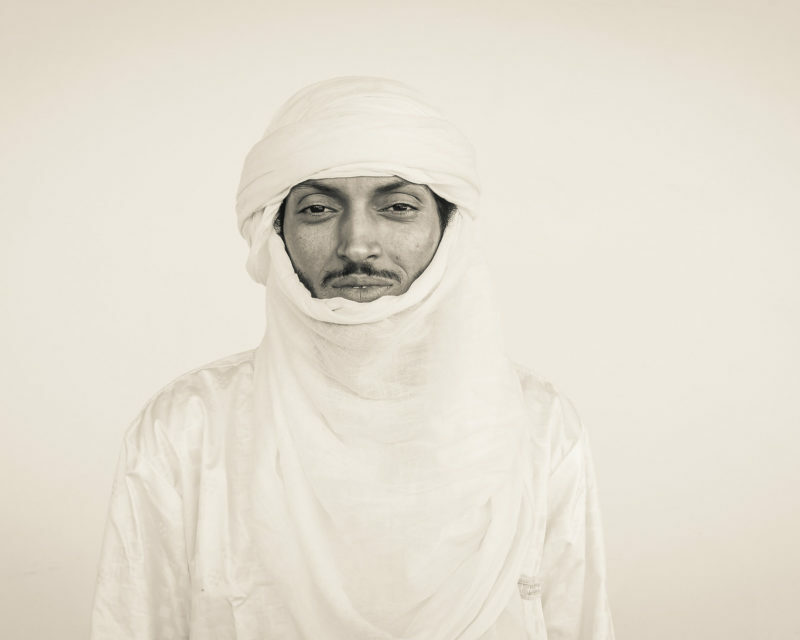 It’s a turning back the source of everything that makes Bombino who he is. “My mission for this album was always to get closer to Africa,” he says. Not surprising then that the decision was made to record Deran as close as possible to his native Niger in the southern Sahara. The ideal venue emerged in the shape of Studio Hiba, a top flight recording facility owned by King Mohammed VI (he loves his tunes, apparently) located in a fairly drab industrial suburb of Casablanca in Morocco. 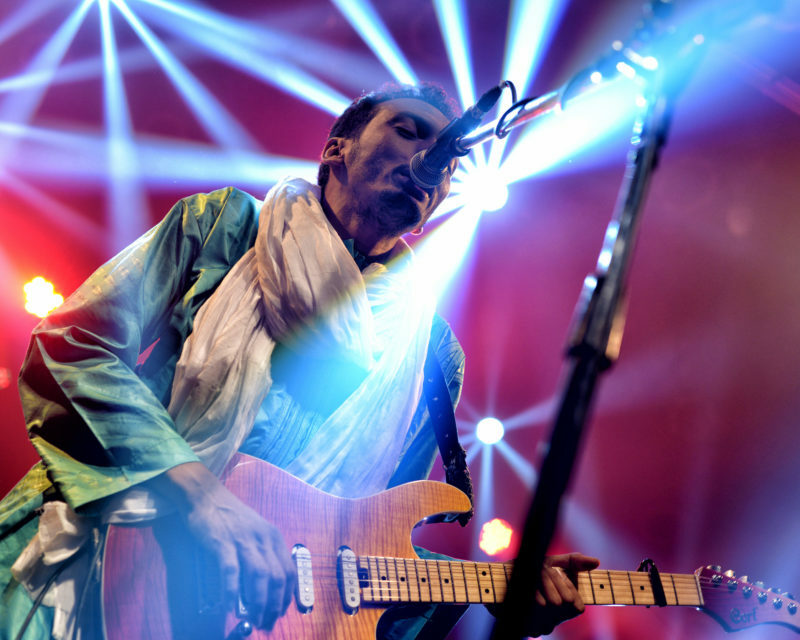 There Bombino and his steady long-term band – fellow Tuareg Illias Mohammed on guitar and vocals, American Corey Wilhelm on drums and percussion and the Mauritanian (living in Belgium) Youba Dia on bass – slept, ate and made music in blissful isolation. Their circle was widened by Moroccan percussionist Hassan Krifa, and by Bombino’s cousins Anana ag Haroun (lead singer of the Brussels-based Tuareg band Kel Assouf), and Toulou Kiki (singer and star of the film Timbuktu), who dropped in to add some ‘gang’ vocals. After Casablanca, the tapes flew to Boston to be embellished by Sudanese friend and keyboardist Mohammed Araki. 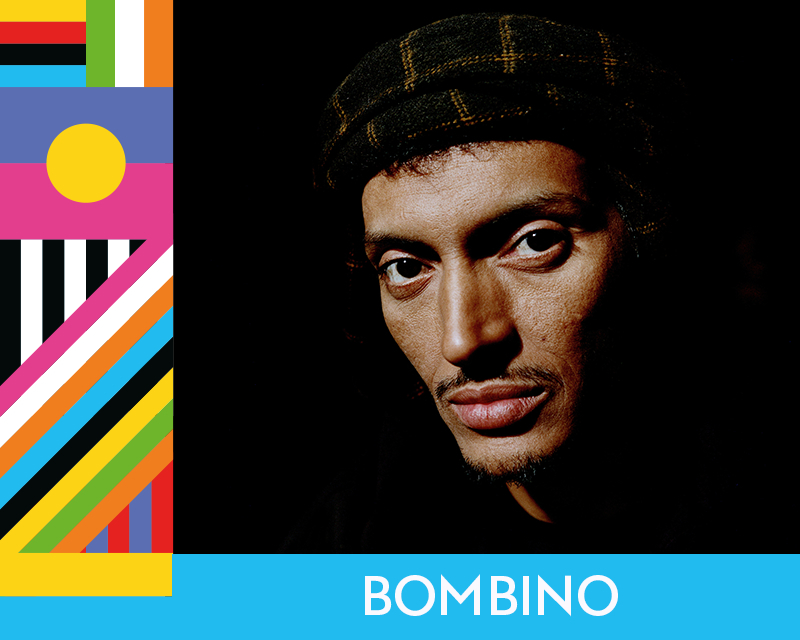 Bringing people together seems to be one of Bombino’s natural gifts. In Europe, North America, Japan, China, Australia, even most recently, Argentina and Chile, the grainy hypnosis of his horizontal grooves, the virtuosity of his guitar style and aerobic explosiveness of his stage shows have hooked a broad gamut of fans ranging from grey-bearded rock and blues habitués, to world-music devotees to young hirsute hipsters – broad enough to include the Rolling Stones, Arcade Fire, Queens Of The Stone Age and the Black Keys (who produced Bombino’s 2013 album Nomad). Less well known is the fact that back in Niger, his music, which he sings exclusively in Tamashek, the language of the Tuareg, has found favor with every one the country’s many of ethnic groups, a feat of immense significance that no other Tuareg artist has managed to pull off. It could also be a small step in a grand dream – to see Africa regain the cultural, ethnic and economic interconnectedness that Bombino and so many others believe it once possessed before colonialism. In the meantime, like every Tuareg, Bombino has to struggle with the inexhaustible tensions at the heart of Tuareg culture and society, between tradition and modernity, between tribes and factions. Almost all the songs on Deran are touched by one or the other preoccupation. His grandparents lived exclusively from their herds, wheeling from well to well according to season and necessity, far from cities and crowds, free in their blessed immensity. How to preserve the essence of that old freedom, and the culture that went with it, whilst embracing the future, and reaching out to the rest of the world? That’s the paradoxical challenge embodied in Bombino’s music, and life. ‘Don’t forget / What we know / What we have learned from our ancestors,’ he sings in “Imajghane” (literally ‘the free people’, aka The Tuareg). ‘My heart is burning! / It burns because of mybrothers / My brothers who do not love each other,’ runs the refrains of “Oulhin” (‘My Heart’). How do you preserve achak – the unwritten code of Tuareg dignity, morality and behavior – in an epoch of Facebook, 24-hour TV, mobile phones and distorted guitars? Note: admission also includes The Battle of Santiago & Shad.